The Palawan area of the Philippines is the nicest, most natural, safe and devoid-of-typhoons area in the country. 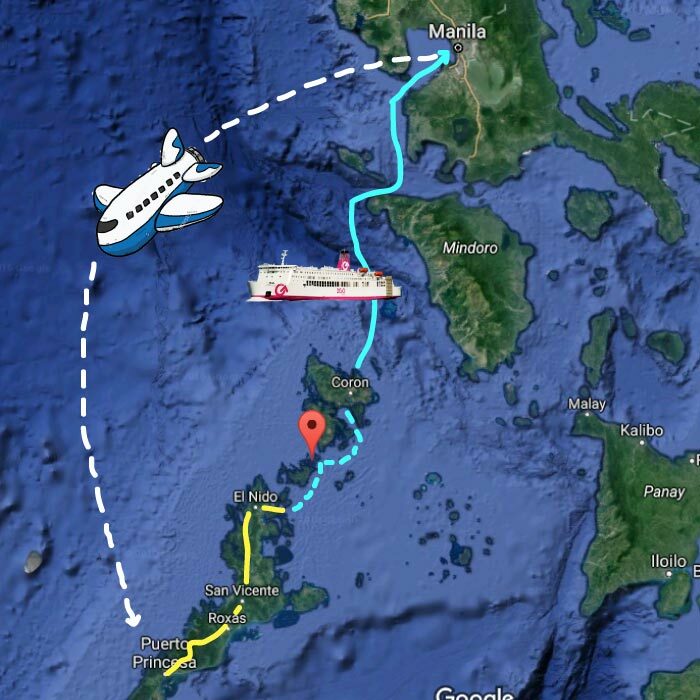 And the Puerto Princesa > El Nido > Coron to Manila corridor is rapidly growing as a favourite tourist route. If you are short of time, such as 12 days or less, and you like pristine beaches and off-the-beaten-path places, I would suggest to fly instead to El Nido and skip the south, since you tend to lose way too much time in a crammed van going from place to place. The underwater river tour is not so spectacular to make it an absolute must see and you will spend most of the day waiting with the flood of other tourists. Port Barton and Sabang are nice off-the-beaten-path places, but there are better or as good places between El Nido and Coron. 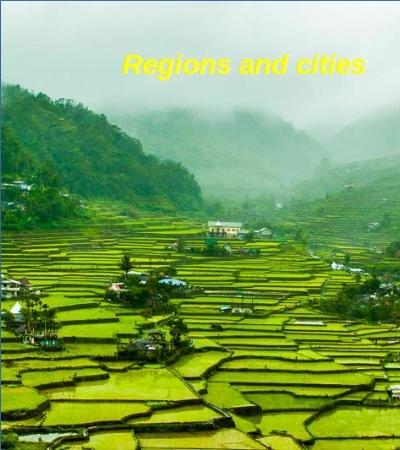 In any case, if you do want to check out the south, below you will find lots of info on places to stay and a good way to go about it. If you would like to limit your tour from El Nido to Coron and like off the beaten path places in nature, you can check out my suggested places to stay along this route. Beach hop your way along the north peninsula with a maximum 30-60 minute van ride each day, until you get to the nice archaeological village of Sibaltan, from where you can start a multi-day Palawan boat tour to Coron and check out the beautiful Linapacan area half way in between, surrounded by 52 other islands. Many of them deserted if you’d like to camp out on some just yourselves. After that you can continue on to Coron, see some more sites along the way, including some of the most popular lagoons to see around Coron. If you are on a tight budget and cannot join a boat tour, you can check out the public ferries and save on inexpensive accommodation available in the Linapacan area, or take less expensive local day tours (reformulated as a 10 day all-inclusive Manila-Palawan package for 10,000pesos). Or get totally off the beaten path and visit our little nature camp on a small, nearby island. If you plan to stay longer, visa extensions are really easy in this country. As explained on the Manila page, if you are limited for time, best to just move on straight to paradise and enjoy your vacation on the beach. If you do have time, the page has some suggestions where you can stay and what to do. Fly to Puerto Princesa, although you can also take a long ferry there. Hopefully your plane will land by 6pm so that can go directly to one of the two travel agencies located to the left as you leave the building. There you can book a van which will pick you up the next morning to take you to the Underground River Tour (in Sabang, below), designated as one of the seven wonders of the world. As explained on the Princesa page above (where you will also find info on vans and buses, or to book the river tour in advance), not so much to see there, so one night should be plenty. The next morning the van will pick you up from your hotel. Make sure to take all your stuff with you, so that you can continue heading north after exploring the underwater river tour. The agent on the right offered a 200p tour of the Mangrove Paddle Boat Tour, while waiting in the long line for the underground river tour, which I thought was better than the local zipline, as I feel the one in El Nido is better. Aside from the busy mayhem during the day, Sabang is a nice peaceful town and I heard a good place to stay overnight, if you have the time. I’ve been told there is a good and active couchsurfing community there. When your or other van takes you back to Puerto Princesa, you can ask them to drop you off at the highway junction so that you can take another one continuing north. If you have the time, Port Barton is another quaint and peaceful town off the beaten path. They recently completed the paved highway there, so who knows how long that will last, but well worth the visit if your schedule permits it. You can also ask around and take a private boat to El Nido, for a greater adventure, as the van ride is not so interesting. If you decide to take the land journey continuing north, there are many vans to catch, but I found the public buses better. Not only are they less expensive, but much more spacious. If you are limited for time, you can take the night bus which leaves around 11pm from Princesa and arrives in El Nido around 5am. The vans, although about one hour faster, can be quite crammed and uncomfortable. If you do stay in Port Barton and don’t mind tenting, I heard good things about Thelma and Toby’s Island Camping Adventure. Like Princesa, El Nido also has a good live music scene, but if you are a musician, it is much easier to find a venue where you can jam with others. Three long beaches for romantic strollers, a great zipline, beautiful lagoons to explore, or you can rent a kayak and explore some of the nearby islands. There are also nice lagoons in Coron, so depending on what you want to see, one to two days should suffice for this town. 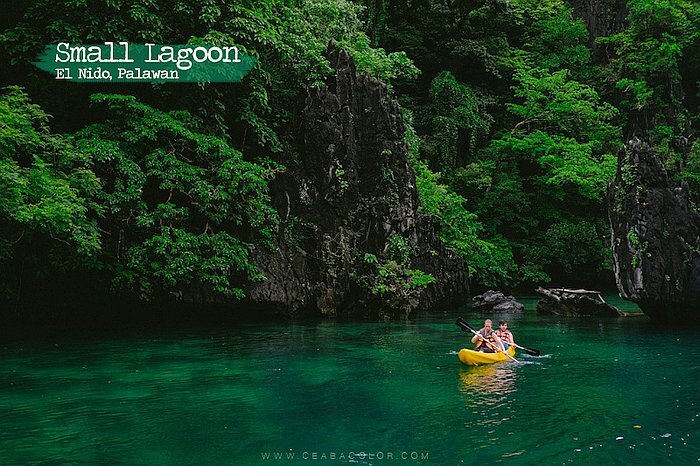 How many places you see in the Palawan area depends on how much vacation time you have. With a seven day trip, I would suggest the underwater tour in Sabang, El Nido, Coron, and to squeeze in at least one other place. You need some time to enjoy and relax and not constantly rushing to the next place. 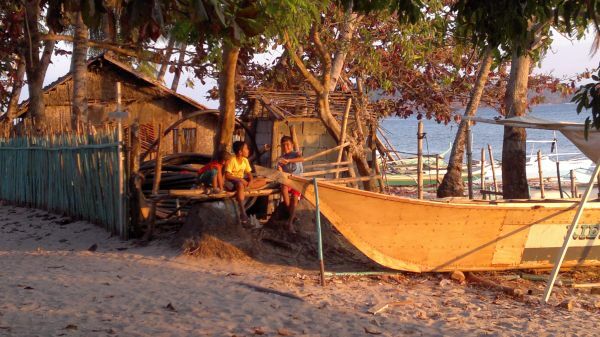 On this page, Sabang, Port Barton, Sibaltan and Linapacan are good places to relax. El Nido and Coron or more high strung but offer special sites and a good night life. I would consider Manila and Puerto Princesa only a quick pitstop. 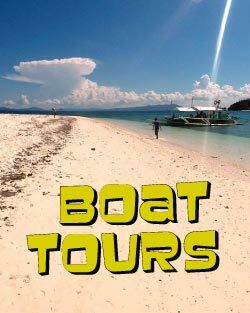 To see the most, a private boat tour is the best, so that you are not dependent on the schedules of the public ferries between El Nido and Coron. The private boat can pick you up from Sibaltan, take you to Pical, tent on a deserted island, snorkel on the way, see the caves of Linapacan, and check out some of the lagoons around Coron before they drop you off there. This can easily work out cheaper than if you tried everything separately. From El Nido you can take a 1.5 hour van ride to Sibaltan, 20 minutes north of which is the port of San Fernando, from where you can catch Marphye’s big banca ferry heading north towards Coron. But the ferry is a grueling 7+ hours, so if you have the time, better to stop halfway in Linapacan. The Philippines has a landmass the size of Italy, but broken up into 7,107 islands. Logistically it is better to choose a certain area and focus on that so that you can also rest and enjoy the sites. Come back another year to see other parts of the country. This is a nice archeological town about 1.5 hours by van ride east of El Nido. You will find a big banca boat builder and an old wooden ship acting as a museum. The town aspires to maintain its historical flavour, it has a very long and beautiful stretch of beach, along a small section of which you will find some great resorts. About 20 minutes to the north is San Fernando, from where a lot of the ferries head north to Coron. Some leave from El Nido, as explained on that page. But if you have some more time, the following is a worthwhile visit. A 30 minute boat ride from Sibaltan, this is a great stop if you have the time. Or is part of our regular island hopping tours if you’d like that option on your way to Coron. If you instead prefer the public ferries (big banca boats) leaving from San Fernando, it will cost you roughly 1,000p each way to get on and off the island from Sibaltan, but with its endless, beautiful beach and warm hospitality of the locals, well worth a visit. 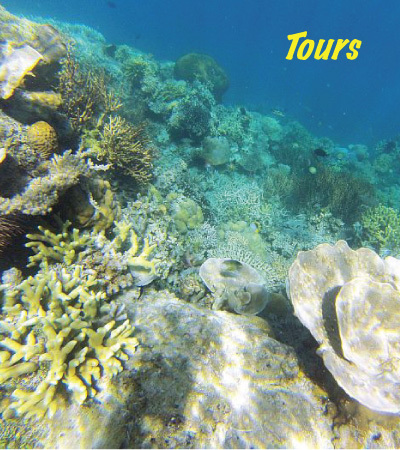 The lodging owner can also organise a local day boat tour for some excellent snorkeling in the area. He also collects the daily catch from all the local fishermen before sending it off to Manila, and loves to cook, so expect the best of fresh seafood. You can check out some reviews at its airbnb listing. You will find the latest information about this on our page here, as it often changes. From El Nido, most of the ferries leave from San Fernando, which is about 1 hour van ride east of El Nido. Once you get to Linapacan, you can take a local, one day tour for as little as 1,500p total for a five person boat. However, the above public ferries have set schedules, which can be delayed for various reasons, in which case, if you are on a tighter schedule, getting on a private boat tour can not only make your trip through the Palawan area logistically easier, but you can see a lot more. There are 52 islands in the Linapacan area alone, and there are several private boat tour operations servicing the El Nido <> Coron stretch, the most famous of which is Tao Expeditions. We work with several operators, found on our Boat Tours Schedule page, where you can also form a group if you want to share and reduce costs (to as little as 1,500p per person for a four day trip). If you hire your own boat, you can invite others to join to reduce costs, and decide who you want to let on board. If you allow others on your booked tour (requires deposit payment in advance), you are in charge of which places you want to see, otherwise you must decide collectively as a group. Note that most of our operators are from Linapacan and depart from San Fernando or Sibaltan (on the mainland east of El Nido). Not only is El Nido significantly farther and would cost more, but the waters can be exceedingly rough around the north peninsula of El Nido and all the special paradise beach islands to visit are east of the peninsula anyway. If you want to check out the lagoons around El Nido, best to organise that separately. Possible interest points.So many islands, so many options. With a private tour you have a say where exactly you want to go. With a smaller group in a smaller boat, or larger group in a larger boat, the cost per person can approach the same if taking the public ferries. Throw in some lagoons before disembarking in Coron and it can easily be less. 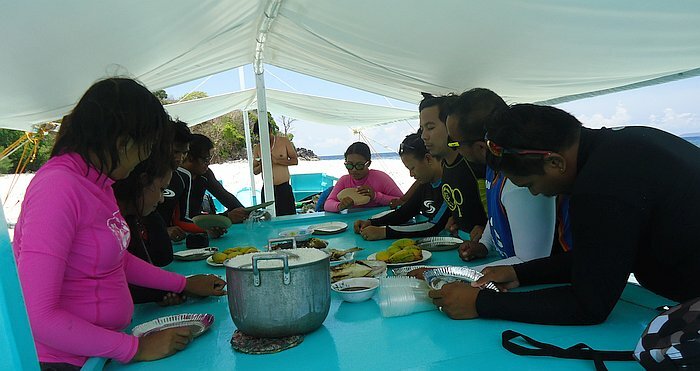 We are growing a network of boat operators, each with their own contacts and relatives owning different islands.This of course can also be taken backwards, if you are going in the opposite direction from Manila, although this way you may need an extra day to see the underground river tour. Below are some of our favourite places so far. 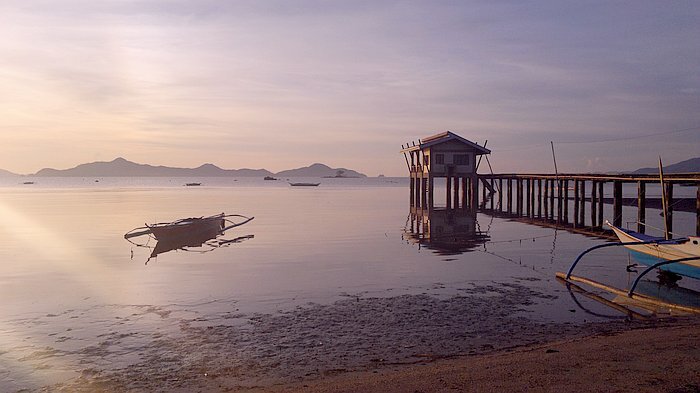 Time permitting, visit this archaeological village of Sibaltan east of El Nido. Would recommend you stay there for one or two nights. 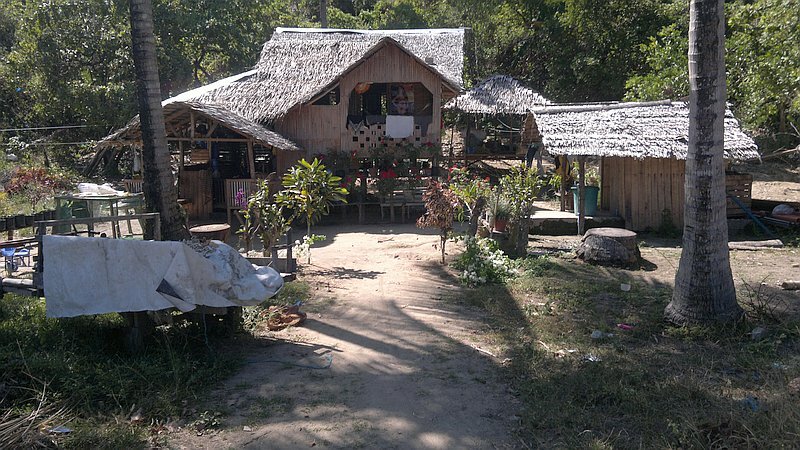 Accommodation on the beach varies from 300p for tent to 1200p for nice cabin. 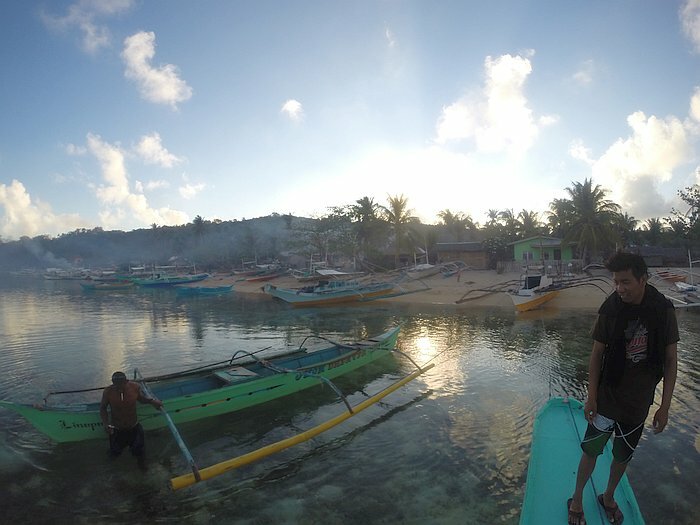 Our boat operator can pick you up from there and take you to a rural, authentic village on a small island. 300p per night for small bed in small room, but worth a visit for a day. 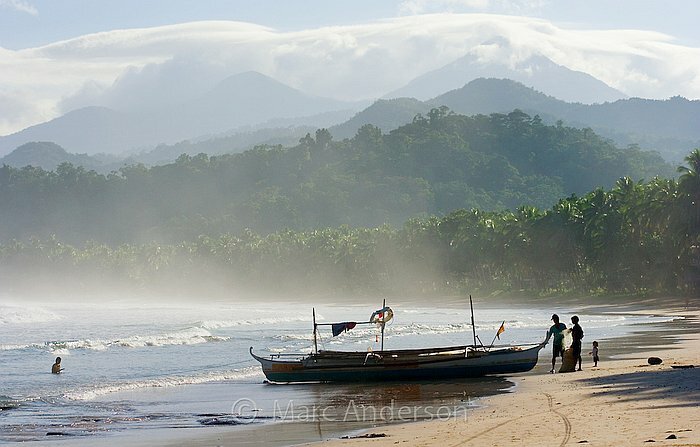 For 300p you can also hire a local guide to take you to an even smaller community, through the jungle to the other side of the island. Then you can camp out on your own deserted island, such as Takling, (next two pictures), or some other deserted islands in the vicinity (last three pictures immediately below – click to zoom in). Food is provided either on open campfire or on charcoal on the boat for 100p per meal. Usually seafood, rice and veggies, but if you want something more exotic, we will tell you where you can stock up on the way and you can even cook it yourself right on the boat! Then it is off to San Miguel in Linapacan, with 52 islands in the area, mostly deserted or sparsely populated for excellent snorkeling (or camping out on) in the clearest waters in the world. There are also caves to explore, trekking in the jungle, kitesurfing at our own resort, diving with hired gear at two sunken shipwrecks, or even stay on your own island overnight. You can combine snorkeling with fishing, or borrow our own fishing equipment, or go on excursions with local fishermen. Learn how to build with bamboo and coconut leaves, or for avid climbers, there are many islands along the way with vertical cliffs plunging deep into the ocean in this interesting post-volcanic terrain. And there is the old Spanish fortress on Linapacan. Lots to see! 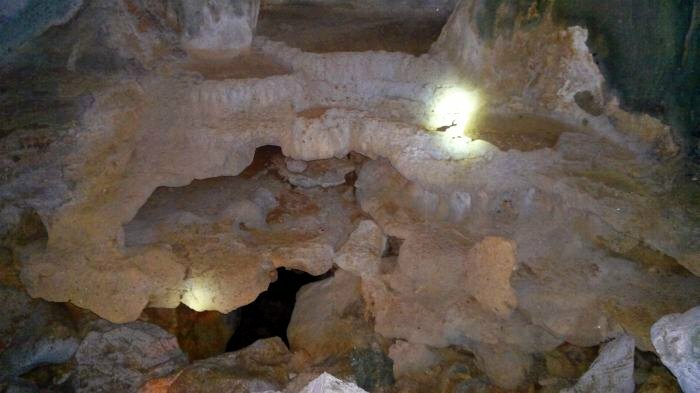 Senora caves near San Miguel. Along the entire journey you can sleep for free on the boat, in tent for 300p per tent or 400p if two people in one tent, or stay in the home or a local for 300p per night. Sheets and snorkeling gear can be provided or hired. Meals are 100p each, and you can stock up on your own booze and snacks. Once you are satisfied with soaking in the paradise and have truly relaxed on your vacation, you can continue on to Coron, exploring some of its beautiful lagoons before disembarking from your fantastic journey. Time permitting, you can even explore the beautiful and secluded area and islands around Culion on the way. 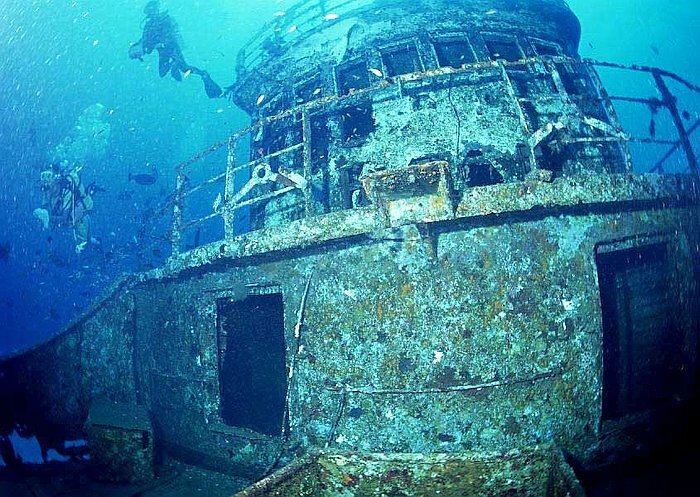 There are eight sunken shipwrecks around Coron, if you are an avid diver, after which we would recommend you take the overnight sleeper ferry to Manila. 1,500p, good live entertainment in the evening, and arrive in Manila early enough in the morning for a quick tour before boarding your flight. We can help you with local Coron tours. 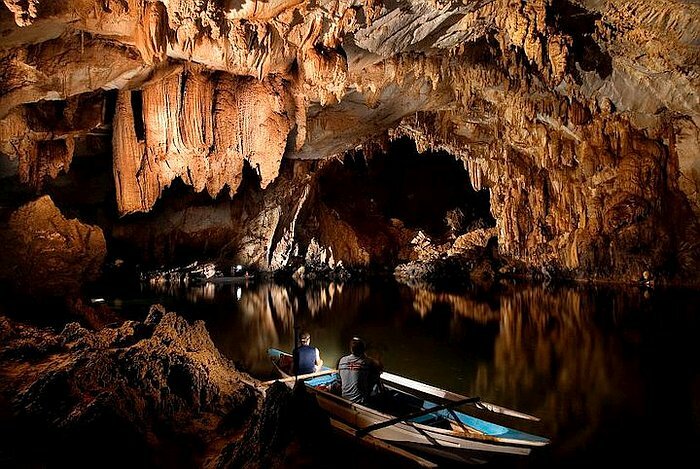 Of course you can also take the trip backwards, but a little harder to see the underground river tour that way. Palawan event calendar – check out some local festivals along the way. If this information was useful, let others know with a review! Looking forward to taking advantage of these suggestions. Can not wait to get there!! Hope you enjoy Aaron, it really is a lovely area. Thanks for all the useful suggestions and information how to travel through Palawan. I really look forward to this trip. Hi the family wants to come to the Philippines as my husband has been working there (ortigas). 5 adults and 4 children. 4 rooms children ages 1-5. We would need aircon for the rooms but would like to know what you would suggest for a multi site holiday experience. Dates 2 weeks end of march and first week in April. Looking for quality budget accommodation. Aircon would be a problem because it requires electricity and only places like Coron, El Nido and Puerto Princesa have electricity 24/7. The smaller towns usually only from noon till midnight or even just 6-10pm in the evenings. The more expensive resorts have their own generators, which they turn on when they have enough paying guests. Perhaps I could at least recommend some things to do during the day only? I tend to specialise in off-the-beaten track places. Or I can recommend some accommodation I liked in the bigger tourist venues. For me a fan alone is always sufficient. Keep in mind also that you can easily catch colds because of aircon, in these tropical climates, as they harbour certain bacteria, which just circulates around the room, and you can easily wake up with a major sore throat. Your site here very informative and definitely has my interest. Once I have finalized some travel arrangement holes this type island hopping would be awesome! But first.. my ultimate goal is to find dependable transportation either from El Nido to Linapacan, or Coron down to Linapacan.. It seems I might have to arrive at San Miguel landing.. then make arrangements to get on to Linapacan from there. The people I am to meet up with are in Linapacan. Any up to date info from you would be much appreciated. Salamat! “Happy New Year”! San Miguel is on the island of Linapacan, check out http://www.islandhoppinginthephilippines.com/palawan/san-miguel-linapacan/. Some friends are coming for a visit and, after doing a lot of research, proposed the following itinerary. Just throwing in more ideas! 29.1. night in hotel in Puerto Princesa!!! 31.1. in Port Barton find a boat to El Nido, goes each day from 8am to 1pm at the intersection across from Ayette’s Bamboo House or from Recaro terminal. Tickets are 800p if they are reserved through Recaro. 1.2. one hotel / on the beach in Port Barton????? Mindoro, San Jose -> Mindoro, Calapan ????? I frequently visit Manila for work and of late I have been taking a weeks’ leave each time I go there so I can explore the many island. Started with the tourist attractions and now getting more confident and looking at the more remote places. I am scheduled to do El Nido in April this year after spending a week in Coron last year (less the 2 days I stayed on Banana Is.) that was awesome, I was the only tourist to stay overnight. I have penciled in Linapacan for visit. I will touch base when I am closer to booking. okay, see you then David! Great place to check out if you like to get off the beaten path. We will stay in coron for 3 days from Sept 3-5. 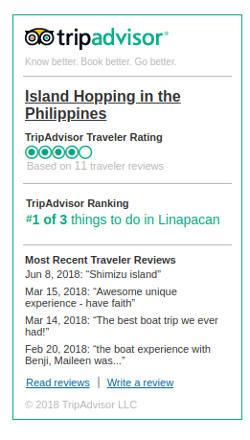 Linacapan wasnt initially in our itinerary but after reading your post it got me to think that its better to visit that paradise too before going to El nido. How far is it from Coron Sir? I’m just wondering how much will it cost to have a day trip there, or do an overnight stay as your post suggest? It’s really okay for us to be mixed in a group too. I wonder if there are boat going from Linacapan to El nido as well? 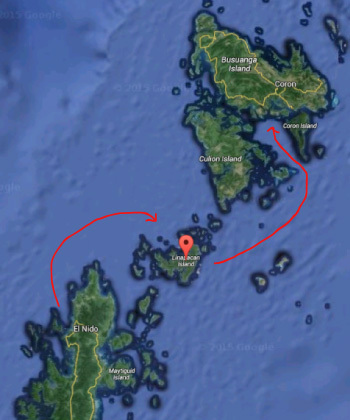 Linapacan is half way between El Nido and Coron and about 3.5 hours for each leg, depending on the size of the waves. Details on the ferries here. Accommodation is generally inexpensive in this area, around 500p per room. Ferries can continue on to El Nido as well. is there any thing we can do between Puerto princesa and el nido? can we get off the bus and explore? or is there nothing entertaining between the bus ride? Nothing that I know of really worth visiting, unfortunately. I and my friend intend to stay in Sibaltan for a couple of nights. I just wonder if there is any daily tour from Sibaltan to Linacapan? How much is it and its initially? Im just so in love with the idea of snorkling in the clearest waters in the world. HI May i know how much will that cost to complete the above suggested itinenary? what is the best recommended time & duration of travel? 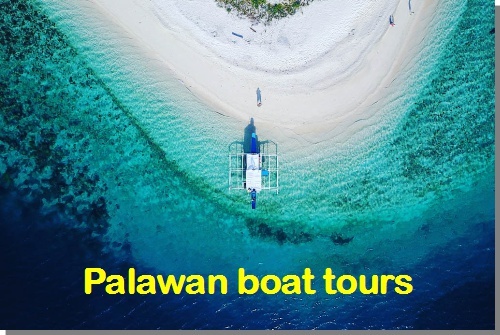 this would be the cheapest option: http://www.islandhoppinginthephilippines.com/palawan/boat-tours/ten-day-return-trip-manila/. 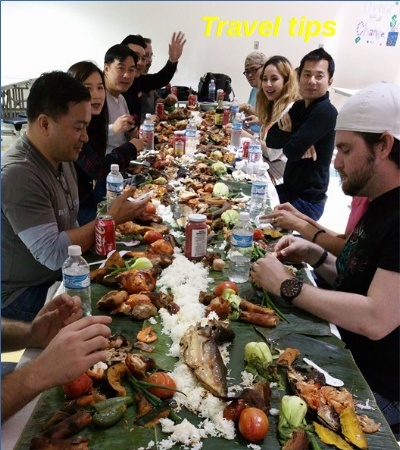 Otherwise you can fill in the form at http://islandhoppinginthephilippines.com/sqlite/register/book1_basics.php to get an instant quote for a private tour. Amazing page! Me and my partner are going to Palawan end of January. After reading your post, I’ve decided to skip the Underground River and go straight to El Nido then Coron. If I do the private boat tour between El Nido to Coron, do you think I should do the separate tour in Coron? such as the Ultimate Coron Island Tour and the Malcapuya Island Loop Tour. Thanks for the very quick and prompt response Sam. I’m still choosing between a ferry to Coron then take local tour or take private boat tour from El Nido to Coron and skip the tour in town altogether. We’re not big on diving but love snorkeling.